Bottle and beverage fillers can be rotary or inline, intermittent, or continuous motion. Intermittent-motion fillers stop the bottle during filling and are commonly used for speeds up to 200-300 ppm on smaller container sizes. For higher speeds, especially on larger container sizes, continuous-motion fillers will usually be more appropriate. 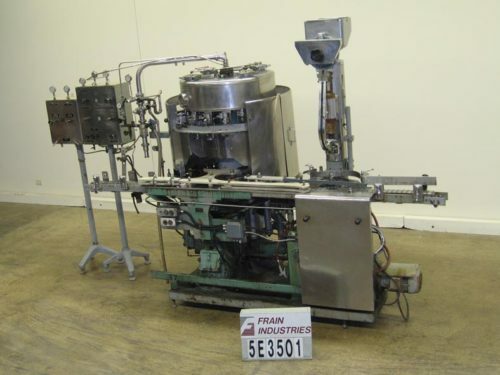 Frain Can help with your bottled beverage liquid filling project. From individual bottle filling machines and equipment to complete lines, call us today to discuss your liquid filling project. In theory most fillers can be used to fill most beverages. In reality, many beverages are carbonated and need to be filled using a counter-pressure filler. Typical products include beer, sparkling wine, soft drinks and soda water. Counter-pressure fillers are often level fillers, filling to a specific level in the can or bottle rather than dispensing a specific volume. Product volume is determined by the container’s internal volume and fill level. Volumetric counterpressure fillers are also used which measure the volume of product independently of the container prior to filling. This provides more precise fill accuracy than level filling. Rotary fillers have a pressurized product reservoir mounted above the turret. The tank is automatically kept at a constant product level. Larger fillers may use a ring or donut instead of a bowl style tank. The Donut minimizes the amount of product in the system as well as the effects of centrifugal force. Filling nozzles are mounted in the bottom of the tank or donut. Counter-pressure filling is a 6 step process. All steps take place on the same nozzle. The bottle (or can) is positioned under the fill nozzle. The nozzles are lowered or the bottle raised to form a gas tight seal between nozzle and bottle. The bottle is flushed with vacuum and CO2 to all air. For products that are highly oxygen sensitive such as beer, multiple cycles may be used. At the end of the evacuation cycle, the bottle is pressurized with CO2 to match the pressure in the reservoir. The equalized pressure allows controlled product flow with minimal foaming from the reservoir into the bottle. CO2 in the bottle vents back to the reservoir. Product level is controlled by how far the filling nozzle enters the bottle or by the external volumetric system. After product flow has stopped, the bottle is lowered, or the nozzle raised and the bottle exits the filler to capping, crowning or seaming. A minimal amount of foaming and CO2 release will occur between the end of filling and capping. This is actually desirable since the release of CO2 means that no air will enter the bottle before closing. Automatic,16 head, rotary, filling, 1 head crown capping, monoblock system capable of speeds from 40 to 75 bpm depending on application. 16 head unit is set on 7" centers, 2 phase counter pressurization filling heads, with 1/2" diameter nozzles, container centering bells, 4" diameter bottom up fill container platforms, and a maximum container size of: 6 1/2" diameter x 15" High. 130" L x 3" W product conveyor, star wheel index, and in feed / discharge height of 45". 1 head mechanical, crown capper, with cap feed hopper, sorting wheel, and cap chute for crown style chuck. Control panel with pre / fill pressure, tank process / tension valve, and lift cylinder controllers. Monoblock 40 Head filler / 8 head crowner capable of speeds 50 to 400 bpm – depending materials and application. Container size range: 2" – 4 7/8" in Diameter; 5-1/2" – 14" in Height. 68" diameter turn table with (40) 3/8" OD / 1/4" ID nozzles set on 5" centers, bottom up fill, centering bells, 112" long x 3-1/4" wide stainless steel product conveyor and worm screw to star wheel infeed and discharge. 8 head rotary crown capper with overhead product feed system with overflow drip, no container / no fill and CIP ring. Last running 12oz carbonated beverage with 28mm crown cap.